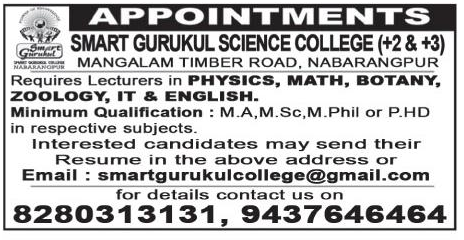 Smart Gurukul Science College (+2 and +3), Nabarangpur has advertised in SAMBAD newspaper for the recruitment of Lecturers jobs vacancies. Interested and eligible job aspirants are requested to apply by earliest Check out further more details below. About College: Creating a vast state-of-the-art academic infrastructure, putting together best of teaching talent. Gurukul Institutes is truly emerging as the nurturing ground for education. It is becoming synonymous with practical and qualitative - focused education and is attracting students from across the state.